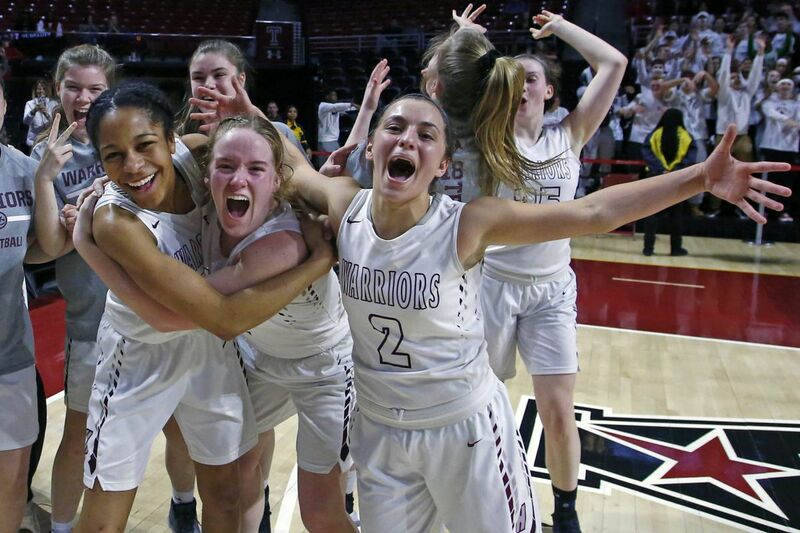 West Chester Henderson players, including (from left) Adrienne Smith, Erin Torrance and Maddie DePrisco (2), celebrate after winning the District 1 Class 5A championship with a 41-32 victory over Villa Maria on Saturday, March 3, 2018, at the Liacouras Center at Temple. Kate Connolly scored a team-high 18 points Saturday as the Souderton girls' basketball team outlasted Central Bucks South, 52-48, in triple overtime, to win the District 1 Class 6A final. Alana Cardona, who finished with 12 points, gave the Indians a 5-point lead in the third overtime with a three-point play. Tori Dowd added 13 points for the victors. Titans' Alexa Brodie led all scorers with 22 points and hit the game-tying three at the end of regulation with 16 seconds remaining. Souderton clinched the No. 1 seed in the PIAA Class 6A playoffs, which begin March 10. Brianne Borcky stuffed the stat sheet with 20 points, seven rebounds, and four assists as Garnet Valley held off Spring-Ford, 65-64, in the District 1 Class 6A third playback. Emily McAteer had 17 points and eight rebounds for the Jaguars. Lucy Olsen led the Rams with 19 points. West Chester Henderson captured the District 1 Class 5A championship by beating Villa maria, 41-32, at the Liacouras Center. Sydney Blum came off the bench to lead Council Rock North in scoring with 17 points as the Indians defeated Neshaminy, 51-47, in the District 1 Class 6A seventh playback. Becca Margolis contributed 16 points in the win. Council Rock North will open state playoffs against Nazareth, who they beat in last year's opening round. Casey Remolde netted a game-high 17 points as St. Basil defeated North Schuylkill, 57-39, in the District 1-11 Class 3A final. Jules Gura and Denae Carter pitched in 15 and 11 points, respectively, for the Panthers. Myah Garrison recorded 15 points and six rebounds as Bonner-Prendergast cruised to a 66-33 victory over Audenried in the District 12 Class 4A championship. The Friars outscored the Rockets 40-8 after halftime. Maeve McCann added 12 points while Dakota McCaughan had 11 points and five assists in the win. Bonner will open the state tournament against North Lebanon on March 10. Maura Hendrixson put up 33 points as Cardinal O'Hara rolled past Olney, 79-33, to win the District 12 Class 6A championship. Jennifer Kremp notched 15 points in Jenkintown's 66-30 win over Sankofa Freedom in the District 1-12 Class 1A final. Mia Kolb had 12 points for the Drakes. Jenkintown will play the Christian School (York, Pa.) in states on March 10. Kyra Quigley posted a double-double with 12 points and 10 rebounds as Sacred Heart Academy beat Delco Christian, 50-24, to win the District 1 Class 2A final. Kaylie Griffin scored 22 points as Gwynedd-Mercy downed Lower Moreland, 59-23, in the District 1 Class 4A final. Dayna Batasa made five threes for 19 points as Upper Dublin edged Perkiomen Valley, 47-44, in the District 1 Class 6A ninth playback. Bonner-Prendergast overcame an 8-point deficit with a minute remaining to stun Martin Luther King in overtime, 64-59, to win the District 12 Class 5A championship. Isaiah Wong poured in 31 points while Tyriq Ingraham had 16 for the Friars. Jahi Randall scored a team-high 20 points as Lincoln knocked off the PCL champions Roman Catholic, 86-76, to win the District 12 Class 6A title. Khalif Mears and Tyree Corbett added 18 and 16 points, respectively, for the Railsplitters. Seth Lundy led the Cahillites with 22 points and 10 rebounds. Lincoln turned the ball over just four times to Roman's 16. Sawyer Smith's driving layup with 3.6 seconds remaining in overtime lifting Faith Christian over Girard College, 48-46, to clinch the District 1 Class 1A final. Smith finished with a team-high 14 points while Owen Bradford added 10. Mikeal Jones led all scorers with 22 points for Girard College. Max Rapoport scored 14 points as Wissahickon edged Chester, 54-51, in the District 1 Class 5A third playback. Zach Reiner and Anthony Lawrence contributed 12 and 10 points. respectively, for the Trojans. Donte Cruz and Dupree Bryant each scored 17 points to lead Coatesville past Pennridge, 74-66, in the District 1 Class 6A fifth playback. Jahmir Brickus added 16 points for the Red Raiders. Jack Forrest finished with 15 points as Lower Merion rolled to a 68-49 victory over Central Bucks West in the District 1 Class 6A third playback. Julian Hairston contributed 12 points for the Aces. Tajir Asparagus recorded 18 points as West Chester Rustin topped Great Valley, 53-47, in the District 1 Class 5A seventh playback. Dylan Demarco and Jake Nelson both contributed eight points for the Golden Knights. Jackson Piotrowski scored 19 points as Delco Christian beat Dock Mennonite, 44-40, to win the District 1 Class 2A title. Arion Lewis scored a game-high 23 points as Valley Forge Military Academy defended its District 1-11 Class 3A title with a 66-53 triumph over Notre Dame Green Pond. Abraham Deng added 13 points for the Trojans. Council Rock South scored 137 points to win the PIAA AAA Southeast Regional Tournament. Ben Radner, Maximino Mendez, and Kyle Waterman all clinched first place in their respective weight class. Josh Stillings of Pennridge won most outstanding wrestler.